When Marc Shoffman’s brother-in-law turned up with a copy of an LGBT-themed nursery book, the writer was curious to see what his daughters aged 3 and 1 would make of it. “There are only so many times you can read about magic mirrors or the danger of red apples or spindles,” he wrote in a piece for the Telegraph. 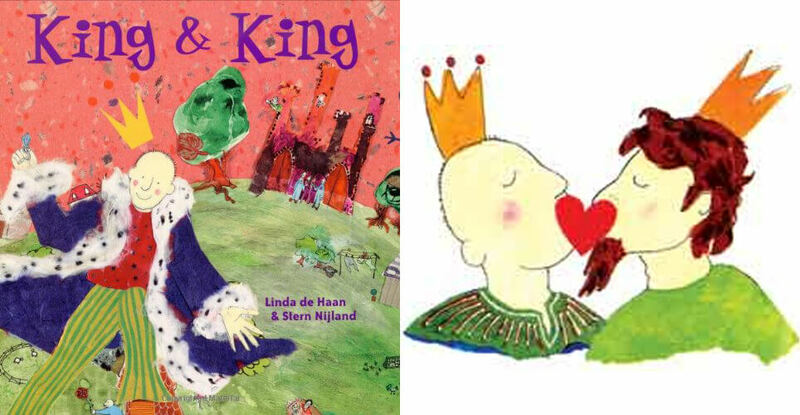 The book that Shoffman’s brother-in-law chose for his nieces was King and King, a simple story about a prince who meets a princess, but ends up falling in love with her brother instead. The story ends with the pair getting married, and is accompanied by an illustration of them kissing. 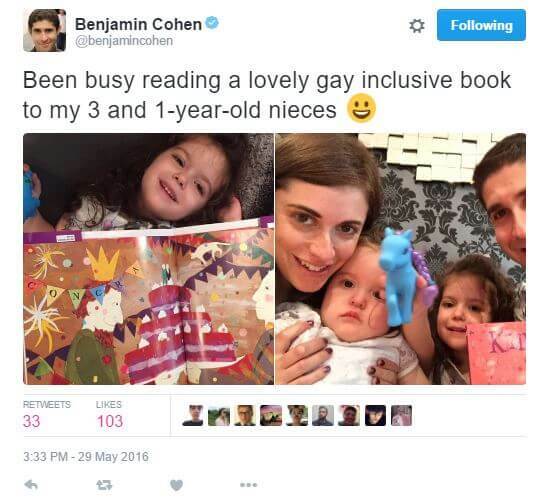 The girls appeared to enjoy the story so much that their uncle Benjamin Cohen decided to tweet a photograph of the family reading the book together. However, not everyone was impressed. “Initially the reaction was positive but 24 hours later my digital life descended into hell,” Cohen told the Evening Standard. Some reportedly told him that he should “pop into the oven”, while others said he should be arrested for child abuse. Some even attacked his infant nieces, labelling them “kikes”, an anti-Semitic slur. The tweets are now being investigated by the police. According to Shoffman, the negative response to his brother-in-law’s tweet underlines the importance of books like King and King and others with a gay or lesbian theme such as And Tango Makes Three and Heather has Two Mummies. “Tolerance is perhaps the most important hand-me-down, and by teaching our children about the normality of different relationships we will help make them understanding and accepting adults,” he said.